The 1914-1918 War Memorial at Holy Trinity Church, Launceston is significant in its size, quality of design and craftsmanship. It is certainly one of the largest and grandest WW1 church-based memorials of its kind in Australia and of a quality typically found in cathedrals. This memorial, in part, reflects the role of Holy Trinity as being the church of the military establishment in Northern Tasmania. The war memorial at Holy Trinity was formally dedicated by Dr Stephen, the Bishop of Tasmania, at a special service held on Sunday, December 22nd 1918, making it one of the earliest war memorials erected. It cost £270 and was designed to record the names of the parishioners who went to the Great War. 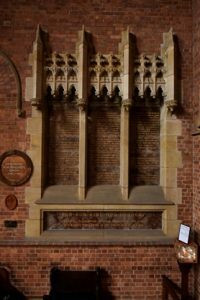 The memorial was the work of Alexander North, the architect who had designed the church building as well as much of the interior fittings only twenty years before. As stated in the local newspaper, the Examiner, at the time of the dedication “[the memorial] has been placed in the north transept of the Church” and “is of carved freestone with panels of Australian marble” which “has been recessed into the wall of the Church and so becomes a part of the structure itself” (The Examiner Launceston, Tas. 1900 – 1954, Monday 23 December 1918 page 5). A rather poignant addition is a tiny cross beside the name of each serviceman who was killed and so paid the ultimate sacrifice in the war. The memorial is remarkable, not just because of its quality and size but because it was completed only six weeks after the end of the war on 11th November 1918. Other churches and communities throughout Australia had been, and were, planning war memorials to recognise their servicemen and women, paving the way for municipal and national memorials. The Holy Trinity memorial however cannot claim to be the oldest Great War memorial – the one at Wickham, New South Wales was dedicated 24th May 1916. The minutes for the committee that was formed for the war memorial no longer seem to exist, but the Examiner, reporting on the formal dedication, stated that the War Memorial committee had been led by E.G. Miller and L. Bell who had also helped in the research and fundraising. Researching the names for the memorial was no easy task and mistakes and possible omissions seem to have been made. One glaring error is the presence of Iles Dore Carr under both the 1914 and 1916 lists. We cannot imagine that there were two men in the parish with identical and almost unique names. The same may be true for Henry Warner (1914) who may be the same as Cecil Henry Warner of 1915. In terms of omissions Thomas Haslam, listed on the memorial for 1915, was identified as a Wilfred Thomas Haslam (born 1895), however, his father Thomas Haslam (born 1872) also fought in the war. Who is commemorated and who has been left off the list is unknown, but both Thomas Haslam Senior and Wilfred Thomas Haslam are included in this book. Another unfortunate omission is one of the Birnie brothers. George Birnie is on the 1915 list but his brother Frederick Birnie, who also enlisted with him and who embarked on the Ajana at the same time, is not mentioned. Sadly, Frederick was killed in action in 1917. Most of the servicemen have links to Holy Trinity but we wonder whether there was a certain amount of family pressure to include men like Alan and Cecil Littler whose brother Charles was a local hero and whose family attended Holy Trinity. Alan had lived in New Zealand and fought with their forces while his brother Cecil lived in South Africa and fought with their forces. We have been unable to firmly identify some of the men listed on the memorial probably because of the common nature of their names: John Lewis, Jack Brown, Fred Brown, Joseph King, Henry Warner, and Robert Stubbs. Sometimes their enlistment papers show an entirely different name – Hedley Rosevear enlisted as Hedley Gordon Brown, and Colin Milner was also known as Colin Henry Gunn. Then we have men who may have been known by abbreviated or “pet” names e.g., Harry for Henry, Jack for John. Was Jack Newton the same as Terence John Newton? Tom Collings actually enlisted as James Collings and Algerian Rouse on the memorial was Algernon Rouse according to his enlistment papers. Cyril Henry Rose was actually known as Cecil Henry Rose. 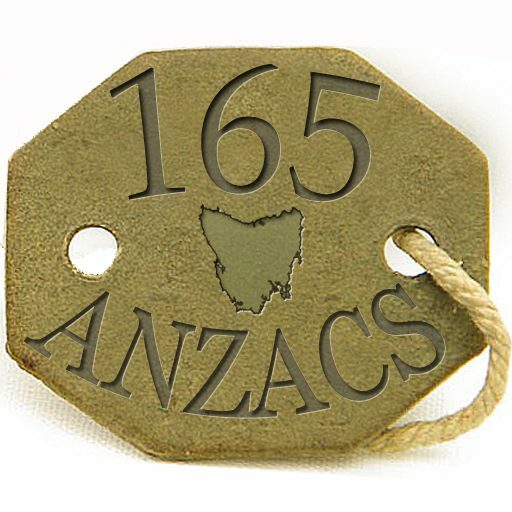 There have also been men whose service record has been difficult to find probably because they did not fight in the Australian Army. So we have Alan Littler, Perceval Higgs, Roy Dean and Harry Robins fighting for New Zealand, Charles Pike a merchant seaman, Clive Roxburgh, serving in the Australian Navy, Cecil Littler in South Africa and Percy Oliver fighting for Fiji. It is more than possible that the service records for other men will be found in other countries’ service records. Although the enlistment entries for 1914 are in strict chronological order the list becomes more jumbled as the war progressed for example, Lance Hudson, William Sutton and Alfred Taylor all enlisted in 1915, but appear under the 1916 list. It may be that they were missed from the original listing and changes could not be made. It needs to be recognised that no women were recorded on the memorial, even though there were women from the local district who were AIF nurses who played a major role in the treatment of the wounded and sick Australians of WW1. This issue is reviewed later on in this book.